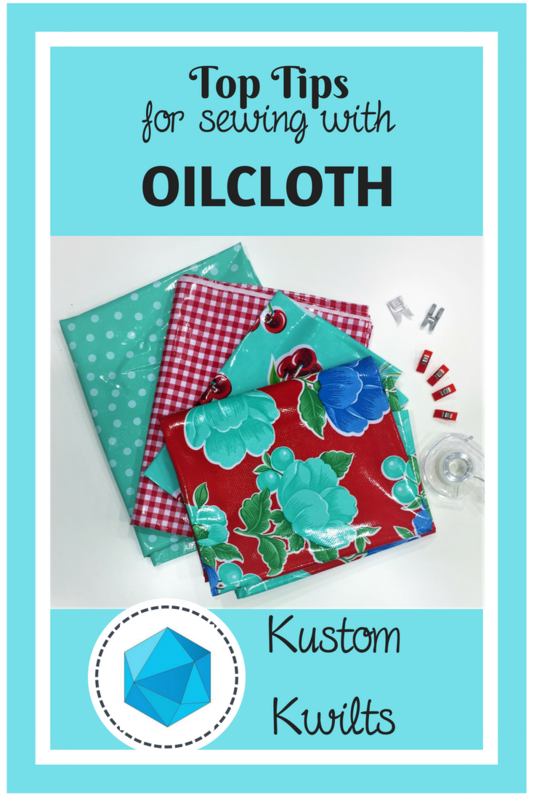 So I know what you’re thinking…this blog is called “Kustom Kwilts”…what gives with the oilcloth? There are so many skills in sewing and quilting that can be transferred to other things-garments, bags, household and decor items. If you can sew a straight line, there are so many other amazing things you could be creating if you’re willing to do a little exploring. 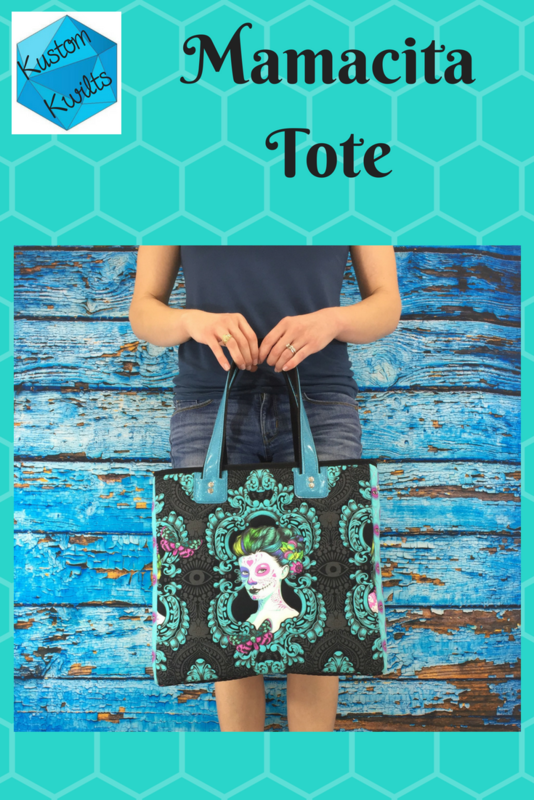 I just released my new Mamacita Tote pattern, which is a perfect fit for using quilting cotton AND alternative fabrics! 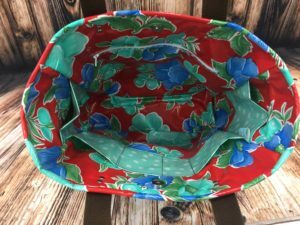 The pattern suggests using oilcloth for the lining, and I don’t want to leave you hanging on how to do that (you can also use quilting cotton). 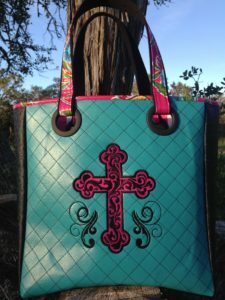 I love to quilt, but I also adore sewing clothing and bags. I hope I can share some of that love with you! What do I mean by alternative fabrics?? I’m talking about vinyl, leather, faux leather, and one of my personal favorites, OILCLOTH. I’d love it if you were willing to read on and open yourself up to some great new possibilities for yourself! It’s water resistant/doesn’t absorb water. It is super-duper easy to clean. All you need is a wet paper towel and you can wipe off pretty much anything. It’s more stable than quilting cotton, so most of the time it doesn’t need extra interfacing when used in bags. When you use it as a purse lining, it wipes clean and is SO easy to maintain! I’m sure I’m leaving a few important things out, but these things alone are pretty fantastic. 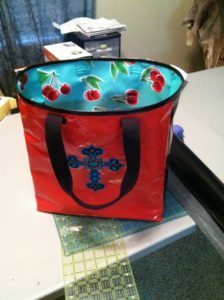 There are some things you’ll want to know about sewing with oilcloth and what you want to do a little differently than if you were sewing with regular quilting cotton. The holes your needle makes in the fabric are permanent. That means you want to use a longer stitch length (somewhere around 3.5) so you have less perforations in the fabric. If you’re using a teeny tiny stitch length, your needle is making a ton of holes that’s making your fabric weaker. Don’t use sewing pins! The holes they make will be permanent. 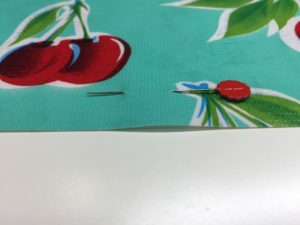 When securing oilcloth, use clips instead of pins. Pins and oilcloth are a big No-No! Don’t do it! Use a Teflon or non-stick sewing foot to help the oilcloth slide under your foot with ease. If you don’t have a Teflon foot, you can also stick a piece of satin scotch tape under your sewing foot, and that will help ease the fabric instead of sticking to it. You can also use tissue paper between the presser foot and the oilcloth, then tear it away when you’re done. 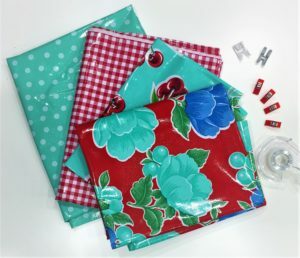 Since oilcloth is a little thicker than cotton, try using a slightly larger needle, like one suited for leather or denim. If you try a smaller needle and it works okay for you, stick with it–because that means the holes the needle makes will be smaller :). It’s finally here! 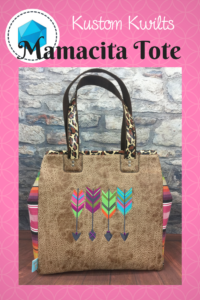 The Mamacita Tote Pattern Release!!! 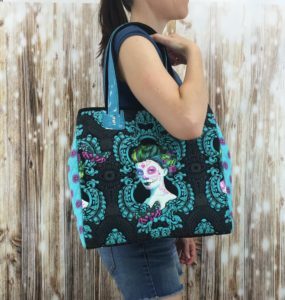 Today is the official release day for the Mamacita Tote Pattern! Hip hip hooray!!! I’d love to tell you the story behind this pattern and why it’s so dear to me. It isn’t exactly swoon worthy, but I loved it. I used this bag for about a week before I realized the importance of interfacing and stabilizer in a bag this size, and made from all oilcloth. It didn’t stand up on its own and was pretty floppy. Also, when you sew with oilcloth, the holes made by the needle are permanent. That means if you don’t lengthen your stitches, you’ll get lots of perforations that will weaken the fabric. Hence, sewing the straps directly to the oilcloth where all the weight will be stressing the fabric = terrible idea. I still have this bag in my sewing room and love to bring it out and see how far my design has come since January 2013. That’s right. This pattern has been FIVE YEARS in the making. I needed a better way to attach the straps and I wanted a more stable, sturdy bag. So another year of trying out different things and I came up with using large drapery grommets as the strap attachments. I really loved this, but after I got a package of grommets from the manufacturer and they were all cracked from shipping, it was time to rethink using them. I couldn’t risk having one break and then go through the hassle of replacing them all the time. Quality supplies are my top priority. 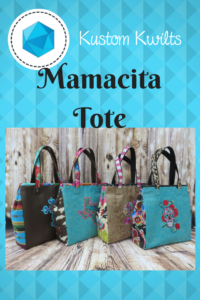 The Mamacita Tote has been my ultimate labor of love, and I know this pattern by heart. I love that the lining keeps me organized with all the pockets, and that I can still be stylish or trendy with my fabrics. Every time I make one, I remember how much I’ve grown as a sewist and how much I’ve learned from all my trial and error and fearlessness as a novel sewer. 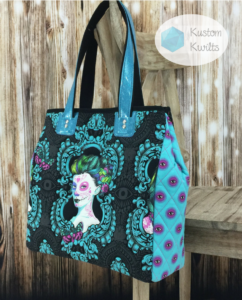 I’d love to see your take on the Mamacita Tote and I hope you’ll share your creations with me (use the hashtag #mamacitatote or tag me @kustomkwilts) so I can see the amazing work you’ve done!